Former Braves All-Star pitcher Jair Jurrjens has been suspended 80 games under baseball's minor league drug program after a positive drug test in the minor leagues. There are many paths a team can travel to October, but in case you hadn't noticed, there are a few juggernauts out there trying to sneak into this postseason in ways almost no one has before them. The Colorado Rockies placed first baseman Justin Morneau on the 15-day disabled list Monday with a strained neck. 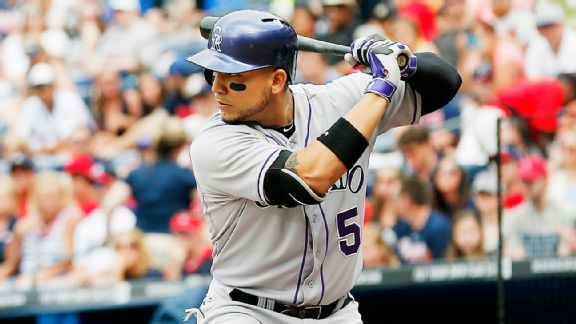 Colorado Rockies outfielder Carlos Gonzalez went 1-for-4 in his return from the disabled list Friday after he missed 35 games because of left index finger inflammation. Jair Jurrjens was breathing a little easier Saturday after the tightness in his chest turned out to be nothing more than a scare. Colorado Rockies pitcher Jair Jurrjens was taken to a nearby hospital for tests after developing breathing problems soon after being removed from Friday night's game against the Los Angeles Dodgers. The Colorado Rockies have promoted Jair Jurrjens from the minors, and the right-hander will make his first major league start in more than a year Friday night against the Los Angeles Dodgers. The Baltimore Orioles have selected the contract of right-handed reliever Jairo Asencio and designated pitcher Jair Jurrjens for assignment. Brian Roberts has been activated from the disabled list by the Baltimore Orioles, who made room for the veteran second baseman by designating pitcher Jair Jurrjens for assignment. The Baltimore Orioles have recalled right-hander Jair Jurrjens from Triple-A Norfolk and designated first baseman Travis Ishikawa for assignment.